The engendering of the spirit of entrepreneurship in a population is one of the most essential prerequisites for successful transition. The limited reappearance of self-employment in the Cuban economy has brought the question of the future of Cuban entrepreneurship under a new light. Almost immediately after economic reforms legalizing some forms of self-employment were passed, thousands of Cuban entrepreneurs, many from the informal sector, began official private economic activity. These entrepreneurs seemed to offer hope to those who believed that over three decades of almost uninterrupted repression of the private sector had all but killed Cuba’s spirit of entrepreneurship. But how useful will Cuba’s diminutive new entrepreneurial class be to the economy in the long run and what are its odds of continued success in a transition economy? Some authors (e.g., Pérez-López 1995, p. 172) have argued that small pockets of private activity in centrally planned economies serve as “breeding grounds” for future entrepreneurs who will create the backbone of a modern economy. Others (e.g., Perry, Steagall and Woods 1995, pp. 98-99; Locay and Sanguinetty 1996, p. 320) are less optimistic and believe that lack of managerial and entrepreneurial skills will contribute to a very slow start for small business in Cuba. The question is impossible to answer with any degree of certainty, but it is possible to draw parallels with previous experiences in economies that have undergone processes of transition. Cuba’s reforms are not without historic precedent in a centrally planned economy. Similar attempts to boost economies suffering from the inefficiencies of central planning have been implemented in a number of socialist countries. This paper will draw from the transition experiences of the Visegrad countries—the Czech and Slovak Republics, Hungary, and Poland—and examine their pre-transition experiments with the private sector. The paper will begin by looking at the different roles played by the private sector up to the point of economic liberalization. It will then analyze the development of small business relative to each country’s starting conditions at the time of transition. Data on the number of self-employed, owner-operated businesses, and registered entrepreneurs will be examined in order to assess the emergence of the “small” private sector, that is, the private sector composed of emerging small businesses rather than privatized companies formerly belonging to the state and maintaining a large number of their employees. Statistics on business registrations and the like are notoriously poor and often misleading. This is so because entrepreneurs often register without ever beginning economic activity or register two or more business “just in case.” Also, business failures often fail to make it on the register. For these reasons, the statistics presented here should be considered a proxy for entrepreneurial activity and interpreted with care. Despite the importance of the informal sector in the Visegrad countries as well as in Cuba, the paper will focus on the formal economy as a source of private entrepreneurship. The reasons for this are twofold. First, data for the informal sector are extremely unreliable and make analysis of this type guesswork at best. Second, the nature of the informal sector sets it apart from the legal private sector. Because informal entrepreneurship is, by definition, illegal (whether tolerated or not), the focus of those activities tends to be on short-run profits. There can be little room for concern for longer term investments and growth in such a volatile business sector. This said, many informal sector entrepreneurs in the Visegrad countries moved into the formal sector during the initial phases of transition. Also a great number moved from the legal private sector into the informal sector in order to avoid fees and taxes charged to registered entrepreneurs. These are further reasons to interpret the statistics put forth in this paper as indicators of the magnitude of entrepreneurial activity rather than point estimates. On September 8, 1993, the Council of State approved Law-Decree No. 141. This was followed by regulations issued jointly by the State Committee for Labor and Social Security (CETSS) and the State Finance Committee (CEF). Together, these two documents acknowledged the importance of self-employment to the national economy and set out a list of 117 occupations, many previously performed by the informal sector, in which such activities could legally take place. Fees would be charged according to the type of occupation which included mechanics, hairdressers, taxi drivers, blacksmiths, and plumbers (EIU 1993, p. 13). However, these laws did not allow for hired labor and, more importantly, prohibited anyone with a university degree, especially physicians, teachers and researchers, and managers of state enterprises from taking up private activity. The decree and regulations further limited participation to those who were currently employed in a state work center, were retired or disabled, had been dismissed from the state sector or had been certified redundant by their employers, had suffered reduced hours as a result of the special period, or were homemakers (Pérez-López 1995, pp. 163-165). A number of other market-oriented reforms took place in the period 1993-94. For example, also in 1993, the Cuban government legalized dollar holdings and transactions and announced the transformation of collectivized state farms into producer cooperatives. In the following year, farmers’ markets were once again allowed to operate as were markets for handicrafts and surplus manufactured consumer goods. Reforms led to an surge in the number of small private restaurants or paladares and a large increase in the number of self-employed workers (Font 1997, p. 125). The estimates for the total number of self-employed workers vary but they seem to have increased from about 70,000 at the end of 1993 to 150,000 a year later. By the end of 1995 approximately 208,000 workers held permits for self-employment. This would make one in every 20 members of Cuba’s labor force a self-employed worker (Jatar-Hausmann 1996, p. 213). Most estimates of the informal sector put about the same number in similar but unlicensed activities. More recently, the government has continued to increase the number of occupations authorized for self employment but also increased the fees charged for such activities. This, together with bureaucratic barriers to entry, has caused a leveling off and even a reduction in the number of self-employed workers. By June 1996 the number of self-employed workers had fallen to 200,000. However, university graduates are no longer excluded from self-employment, a change brought about by pressure from traditional elites previously left out of the new opportunities in the private sector (Jatar-Hausmann 1996, p. 214). Cuba’s experimentation with a self-employed private sector is not without precedent in a centrally planned economy. Most of the Central and Eastern European economies which practiced central planning resorted to such measures in times of economic difficulty. In fact, Hungary and Poland began implementing reforms of this nature well before the historic transition of the late 1980s and early 1990s. The incentives for such reforms were not unlike those in Cuba in the 1990s: a desire to provide a boost to an ailing economy while hoping to preserve the socialist political order. The four Central European countries examined here had very different laws and regulations governing the private sector and private entrepreneurs prior to embracing market reforms. Each allowed private economic activities to some degree, but the restrictions placed on these entrepreneurial activities differed greatly. So did the number of years’ experience that each country had in experimenting with the private sector. These differences meant that the starting conditions for the private sector at the time of transition were quite different. As mentioned earlier, statistical coverage of private sector activities was extremely poor in communist countries. Therefore, for years prior to 1989, it is difficult to assess the size and importance of this sector to the central European countries examined in this paper. This section attempts to provide a brief assessment of the extent to which private economic activities existed alongside the centrally-planned economies. Of the countries examined here, Czechoslovakia had the tightest control on private-sector activities. Private entrepreneurs were excluded from most sectors of the economy. In fact, virtually no private-sector reform took place after the Prague Spring invasion of Soviet and Warsaw Pact troops in 1968. In 1980, 99.8 percent of the workforce was employed in the socialist sector (Gawdiak 1988, p. 135). This meant that by 1989, the contribution of private firms to Czech GDP was very small, estimates ranging from less than 0.5 percent to 4 percent (OECD 1996, p. 18 and Borish and Noël 1996, p. 88). The same was true, of course, for the Slovak Republic. Prior to the Velvet Revolution in 1990, State Owned Enterprises dominated the enterprise sector. Prices, trade, and investment were controlled and private property had virtually no protection. This meant that, unlike Hungary and Poland which had relatively open private sectors, Czechoslovakia had virtually no experience experimenting with economic reform prior to economic liberalization. As what later became the Czech Republic moved into the initial phases of economic and political transition, only about 8,000 sole proprietors existed. Because this was the extent of private-sector activity at the time, the number of commercially active persons in the Czech Republic could also be estimated at about 8,000.1 However, the flowering of the private sector immediately following the shift to a market economy was quite remarkable. In the first year of transition, the private-sector contribution to GDP increased more than twofold. By 1994 the private sector was responsible for 56 percent of GDP and 65 percent of employment (see Table 1). Much of this increase in private-sector employment was generated by owner-operated and small-scale light manufacturing and service sector businesses. The number of sole proprietors in the Czech Republic jumped to about 925,000 in 1994 (excluding corporate bodies), a 115-fold increase in only five years (OECD 1996, p. 29). Much of this growth has come from the service sector which today accounts for 54 percent of the country’s total output, up from 36 percent in 1990. Rough estimates now attribute 57 percent of industry, 90 percent of construction, and over half of transport to the private sector (Borish and Noël 1996, pp. 88-89). These trends suggest that the small-scale owner-operated private sector has been growing while large-scale state owned enterprises in the industrial sector have been declining as indicated by an increasingly smaller contribution to GDP. However, it must be noted that the split with the Slovak Republic helped the Czech Republic release many of the uncompetitive, heavy industrial enterprises of the former Czechoslovakia. Also, the Czech and Slovak Republics benefited from a relatively large industrial base, proximity to the industrial market economies of Central and Western Europe, and an early emphasis on rapid privatization. The Slovak Republic has also experienced important growth in the private sector. Despite a significant slowdown in the rate of privatization following the initial efforts carried out while still a part of Czechoslovakia, the private sector’s share of GDP grew to 58 percent in 1994 from 27 percent in 1991 (the first year for which data is available). Employment in the private sector in 1994 represented 55 percent of total employment, up from 16 percent in 1991 (see Table 1). The growth in the number of Slovak sole proprietors has also been impressive. The number of private (small) companies grew from about 2,000 in 1989 to around 280,000 by the end of 1994. However, the number of small companies in operation per 100 inhabitants is significantly lower in the Slovak Republic than in the Czech Republic, 5.3 v. 9, respectively. In contrast to Czechoslovakia, Hungary had a well developed system of private self employment before 1989. In fact, Hungary had a longer history of experimenting with private-sector and market-based reforms than did other centrally-planned economies. After a ban on private sector activity that lasted almost two decades, reforms in 1968 reactivated private sector economic activity. From the outset, these reforms resembled those which became predominant during the Soviet perestroika and went beyond those which have been adopted by the Cuban government. Among other reforms, farmers were allowed and encouraged to sell produce directly to consumers rather than to the state sector. In 1982, further reforms allowed the creation of numerous private and quasi-private firms. Self employment was legalized and limited partnerships were allowed providing that a number of legal and professional requirements were met. Table 2 shows the growth in private-sector employment in Hungary in the mid-1980s. While the bulk of private-sector reform in most CPEs translated into small family undertakings in the agricultural sector, significant increases in private activity were experienced in other sectors of the economy as well. The majority of activities in these sectors included repair and maintenance, passenger and goods transportation, building construction, retail trading, catering, and other services. In December 1989 the number of officially registered sole proprietors in Hungary was about 320,000. Hungary’s flirtation with the private sector during the 1980s had increased its private-sector contribution to GDP to 20 percent in 1989-90. By the end of 1994 there were approximately 775,000 registered sole proprietors, an increase of about 140 percent over four years. Also by the end of 1994 nearly three-quarters of GDP was generated in sectors increasingly associated with the private sector— namely “non-material” services sectors (e.g., financial, legal, tourism, consulting services), industry, and trade. By the end of 1994, the private sector’s contribution to GDP had grown to 60 percent. The relatively slower rate of increase in the private sector relative to Czechoslovakia could be attributed to two factors: a more advanced starting point (a considerable number of private firms already existed in Hungary during the 1980s) and a more gradualist approach in the rate of privatization. However, Hungary’s private sector as a share of the economy had reached a higher level than Czechoslovakia and, as will be examined later, Poland. Regardless, the growth in private activities in Hungary can not be ignored. The number of registered firms increased by over 300 percent between 1990 and 1993 while the number of self-employed jumped from 427,500 to 801,700 in the same period. These trends depict a growth of over 400,000 new private firms since 1990 in a country with a population of only 10.3 million (Borish and Noël 1996, pp. 94- 95). The vast majority of these firms are very small (under 20 employees), in the service sectors (such firms were responsible for 14.5 percent of industrial output in 1993), and are estimated to have contributed the most to the growth in GDP. Although the role of private sector activities in the economy was at times quite small, Poland’s communist regime never completely abolished them.2 While the government loosened and tightened its restrictions on the private sector according to the political climate, the existence of the private sector was always legally guaranteed. Private entrepreneurs and small workshops were allowed to operate under the condition that their goods and services were sold to the state sector. In the beginning of the 1980s, the Crafts Code was further liberalized and, in 1983, the pre-War Commercial Code of 1934 was reintroduced. This code, while amended to maintain many of the privileges of the state economy, provided a legal framework for corporate private business (Rostowski 1993, p. 3). Between 1981 and 1988, the number of small private firms operating in Poland doubled; by the latter year the private sector represented over 22 percent of total GNP (OECD 1996, p. 41). With the liberalization of the restrictions placed on private business, private economic activity began to satisfy many of the needs that the Polish state sector was unable to fulfill. It has been estimated that by the late 1980s, privately generated incomes accounted for 35 to 45 percent of all incomes in Poland (Rostowski 1988). The Polish post-transition experience in stimulating the private sector through self-employment, while impressive, does not seem to match the successes attained by the Czech Republic and Hungary. However, the economy has made long strides since full economic liberalization. One of the most important steps toward creating a competitive private sector in Poland was actually taken before the date associated with full economic and political transition. On January 1, 1989 the “Law on Economic Activity” came into force. This law effectively erased all restrictions on, and regulations of, private economic activity. The idea behind this law was to benefit from the gains of unrestricted private entrepreneurship and simultaneously do away with the fundamental ownership and management problems associated with the state sector. Private activity was expected to develop quickly thus eradicating the chronic shortages of goods and services in the economy. The resulting economic development would in turn ensure political stabilization and ensure the maintenance of communist power (Rostowski 1993, p. 3). The failure of the communist government’s last attempts at reforms may be attributed to the government’s oversight in addressing profound macroeconomic problems generated by the state sector and the fact that a large portion of private sector activity continued to rely on arbitrage between controlled state prices and the free prices which the private sector was now free to charge (Rostowski 1993, p. 4). Nevertheless, the private sector’s importance in the Polish economy increased significantly. By the time that full transition began, the Polish private sector had a strong head start. According to official statistics the private sector in Poland accounted for 28 percent of GDP in 1989. This is a larger share than in any of the countries examined in this paper. Nearly half of the nation’s employment was in the private sector. While agriculture played an important role in the Polish private sector prior to transition, there were an estimated 960,000 registered sole proprietors and 650,000 self-employed workers in the non-agricultural sectors of the economy in 1989. Between 1989 and 1994 private sector share of GDP in Poland’s economy increased to 58 percent and private sector employment to 61 percent (see Table 1). Private sector output increased almost 400 percent in U.S. dollar terms, from $16.4 billion in 1989 to $53.0 billion in 1994. The bulk of this growth has come from new private companies. In 1994, Poland had the highest number of owner-operated business in the Visegrad region (Borish and Noël 1996, pp. 100-101). Output of the Polish private sector increased significantly in the years immediately following transition. Most of this output produced was in trade and industry. However, trends show strong private sector growth in services and a continued dominance in agriculture (Borish and Noël 1996, p. 101). Although the situation in Cuba today does not mirror the experience of any one Visegrad country prior to transition, there are a number of similarities which recall the Cuban experimentation with economic reform. Therefore, a number of parallels may be drawn. Were it not for the economic pressures placed on the island’s economy following the ebb of Soviet support, the Cuban economy would most likely resemble that of Czechoslovakia prior to transition. Indeed, the tight controls placed on private entrepreneurs in Cuba, together with the government’s constant tendency to restrict private economic activities, demonstrate a reluctance to reform not unlike that which was evident in Czechoslovakia. However, many of the activities which have been legalized in the wake of the recent economic crisis and which are described in the previous section resemble those which appeared in Hungary and Poland prior to 1989. Like Hungary, Cuba has allowed self-employment in a number of service occupations. These reforms have been instituted with the goal of relieving increasing pressures for labor shedding while helping to satisfy a demand for services which can not be met by the state sector. The reintroduction of farmers’ markets also echoes the first reforms implemented in both Hungary and Poland. Because restrictions are much greater in Cuba today, the growth of private entrepreneurial activity has not been as marked as that which occurred in these countries in the 1980s. Therefore, the entrepreneurial sector’s contribution to national income, while unknown, is certainly only a fraction of that which characterized the Hungarian and Polish economies. Nevertheless, a legal private sector composed of profit- oriented entrepreneurs has been created and their contribution to small business know-how and the possible gains to the Cuban economic culture can not be ignored. But how important is previous experience with limited private entrepreneurship to entrepreneurs in a post-transition environment? Did experimentation with self-employment and a tolerance for entrepreneurship poise Hungary and Poland for a smoother transition than the more restrictive Czechoslovakia? This section will attempt to answer this question, at least in part, by examining the post-transition experiences of the Visegrad countries. Despite an impressive record of private-sector and small-business growth, Poland and the Slovak Republic have arguably demonstrated the least spectacular results of the Visegrad countries. The Polish case is particularly interesting because the country had been experimenting with private sector reforms for some time prior to transition. While the importance of the private sector more than doubled in the first five years of transition, the strides do not seem to match those made by the Czech economy. Why was the Czech Republic, and to a lesser extent the Slovak Republic, able to accommodate such a large growth in private entrepreneurship immediately after economic liberalization despite the almost complete absence of a private sector for over two decades? Does this suggest that situational factors outweigh attitudinal factors when it comes to the development of entrepreneurship? Entrepreneurial talent forms the backbone of a successful market economy. Unlike the state and cooperative sectors prevalent in centrally-planned economies, the private sector can not be created. Instead it is the product of entrepreneurial talent and the economic culture that characterizes it. For the most part, such an economic culture was suppressed in the Visegrad countries as it is in Cuba today. Nonetheless, in Cuba, as in Hungary and Poland, small windows have been opened which have allowed entrepreneurs, in however limited a fashion, to enter the system and profit from their market activities. In every country where this has been the case, there has been an eager population of entrepreneurs whose activities have been limited by legal and physical (e.g., capital, inputs, etc.) constraints rather than talent. There has always been a fear, with regard to centrally planned economies (CPEs), that decades of central administration and planning have changed the mentality of the population and erased the culture of entrepreneurship by reshaping its values, work ethic, and expectations. There is, however, no empirical evidence to suggest that the suppression of a market system and the controls placed on private-sector activities can achieve this. In fact, related empirical studies demonstrate the opposite, that is, that situational factors rather than attitudinal ones contribute principally to differences in economic behavior between residents of market economies and those of the former socialist economies (e.g., Shiller, Boyco and Korobov 1992, p. 127; Leff 1979, p. 46). A recent paper on Cuba by Luis Locay and Jorge Sanguinetty (1996) supports this conclusion. 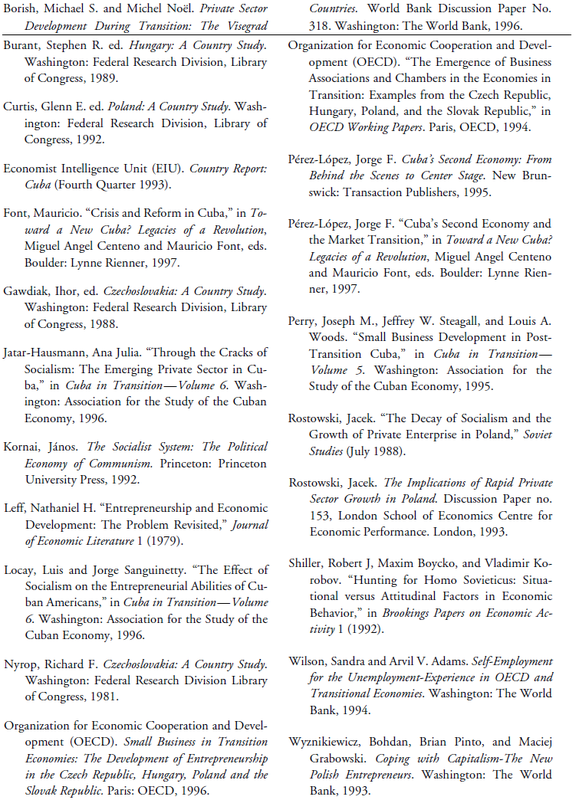 The authors used data from the U.S. Current Population Survey to analyze the propensity for entrepreneurship observed in Cuban immigrants of various ages and who had lived under the two forms of government (Cuban central planning and the U.S. market economy) for varying portions of their lifetimes. These propensities for entrepreneurship were also compared to the overall U.S.-born labor force. The goal of the study was to assess the effects that years of socialism had had on the entrepreneurial skills of the Cuban population. The results generally indicated that the effects were minimal. While important biases, explained in the paper, can not be ignored and make it essential to interpret the results with care, there is no compelling reason to believe that Cuban entrepreneurs will find themselves at a particularly great disadvantage as a result of living under central planning. These studies, when considered in combination with the experience of the Czech and Slovak Republics, seem to suggest that there are other factors which are responsible for the development of entrepreneurial skills and spirit. The private sector in the Czech Republic, and to a lesser extent in the Slovak Republic, quickly caught up to Hungary and Poland. It is as if the entrepreneurial spirit in these countries emerged from nowhere. This is especially evident when one considers the near absence of a private sector in Czechoslovakia at the outset of transition. This is perhaps because the most important incentives for entrepreneurship do not diminish the hope of a higher income and the desire for greater autonomy. The barriers which remain then are bureaucratic and, if they are dismantled or lowered substantially, the private sector in essence creates itself (Kornai 1992, pp. 433-434). The existence of a private sector in a CPE, then, is not a prerequisite to the successful development of an entrepreneurial society and the growth of small business after transition. However, this should not be interpreted to mean that the presence of a private sector is not a boon to transition. Hungary’s posttransition economy has benefited greatly from the private sector it inherited. For example, four years into transition, Hungary had the highest ratio of selfemployed to economically active persons (outside agriculture), a sort of self-employment rate. Almost 15 percent of the active population was self-employed. The corresponding values for the other Visegrad countries (also outside agriculture) were: 9.8 percent in the Czech Republic, 9.6 percent in Poland, and 5.7 percent in the Slovak Republic (OECD 1996, p. 32). Also, the greatest growth in small joint stock companies and partnerships has been in Hungary at about 10 per 10,000 inhabitants at the end of 1994. The Czech Republic has the second highest rate with about 7 per 10,000 inhabitants, followed by the Slovak Republic with around 4, and Poland with about 2.5. For Hungary, these figures reflect the reform policies which began in the early 1980s and allowed the creation of several new forms of enterprises previously unknown in centrally planned economies. This experience consequently provided Hungary with a significant advantage in the transformation process to a market economy. Hungary has remained a clear leader in reform among the Visegrad countries, although the Czech Republic has pushed forward remarkably fast as well. If Czechoslovakia did not benefit from private sector reforms before 1989, what other policies or characteristics of the economy are responsible for the success of its entrepreneurial sector and what lessons might there be for Cuba? The reasons behind the success of the Czech and Slovak Republics are too numerous and complicated to be listed here. However, several deserve mention to place the success in context. The Czech and Slovak Republics have enjoyed a more stable macroeconomic environment than have Hungary and Poland: inflation rates have slowed, exchange rates have remained relatively stable and fiscal deficits have been kept in check. Also, geography and size play an important role as did a speedy move to privatize state industries. As mentioned earlier, the Czech Republic also benefited from the split with Slovakia in that it ridded itself of a great deal of its inefficient and unproductive industries. But other reasons for the success of the two Republics, as well as for the other Visegrad countries, need to be examined. In doing so it is possible to draw important lessons for the success of small business in a transition economy. Privatization and restitution can play a critical role in opening opportunities for small business. Privatization and the creation of new firms were closely linked in all Visegrad countries. For example, many entrepreneurs in the Czech and Slovak Republics utilized property and assets returned as part of restitution to set up new businesses. Also in the Czech and Slovak Republics, managers from state firms took advantage of the system of coupon privatization to set up their own firms. They then used the connections and sales and buying links from their former employers for their new enterprises. Hungary’s diversified enterprise structure owes a great deal to privatization. The creation of new firms in the manufacturing, construction, and retail sectors has been most dynamic in the countries where privatization has made the greatest progress (OECD 1996, pp. 27-28). An unambiguous set of property rights are a further requisite to an economic environment that encourages entrepreneurship. Legal reforms that establish clear and precise laws protecting private property, transfer of ownership, and restitution are vital. Tenancy laws that do not pose unnecessary restrictions on property owners, distort rental markets, or make repossession of mortgaged property difficult are also important. A more difficult problem to overcome is a lack of available capital. In the Visegrad countries, this is the most often cited problem in the start-up of new businesses (OECD 1996, p. 47). This is a more difficult problem to solve as it is rooted in the role of the banking system. In Cuba, the problem may be slightly mitigated by a flow of capital from the United States, both from the Cuban-American community and from investors in general. However, reform of the banking system, an acute and general problem in all transition countries, is of utmost importance to the private sector. The list of problems and challenges is long. Business registration practices, commercial codes and contract enforcement laws, corporate structure and governance, are all issues which, unaddressed, present potential barriers to start-up business and entrepreneurs. Many of these barriers will indeed depend on a history of experience with a private sector. Here, a protracted and expanded private sector reform in Cuba could prove beneficial to post-transition entrepreneurs. A final important component in the successful development of a small business community is cooperation between small enterprises in defending the sector as a whole. This cooperation usually takes the shape of small business membership organizations such Chambers of Commerce and Industry, business associations, and federations. Small enterprises are faced with numerous disadvantages such as decreased access to capital and information and diseconomies of scale in R&D and marketing. Business associations help to alleviate such problems through advisory services, promotional alliances and the like. In transition economies these organizations take on additional challenges brought about by the lack of developed regulatory and institutional environments. The lesson to be drawn from the emergence of the entrepreneurial small business sector in the Visegrad countries is straightforward. While entrepreneurial tendencies can be suppressed over time as they have been in Cuba for over 35 years, the small businessman’s spirit is difficult to kill. Despite a virtual ban on all private sector activities, entrepreneurs in the Czech and Slovak Republics have fared well in the years immediately following the transition. The entrepreneurial sector developed almost overnight. The private sector in the Czech Republic has grown particularly fast and has now caught up and even passed its Visegrad counterparts. Many of the policies developed in these countries in the early stages of transition may be responsible for these successes and may hold the key for Cuba when it begins to move toward economic liberalization. These policies include rapid privatization, clear investment and property laws, as well as civil codes and governance. Although this paper argues that the future for Cuba’s entrepreneurs is not so bleak, there are numerous obstacles which will present great challenges to small business. It is true that a lack of experience and managerial skills will probably raise the volatility of initial start-ups and increase the failure rate of entrepreneurs, but this is part of a learning process that all former CPEs have been forced to endure. Perhaps here, Cuba will benefit from its years of experimentation with small private businesses. Shortage of capital could also strangle private sector growth. For this Cuba will need to rely on transparent investment laws, a speedy reform of the financial sector, and foreign investment, particularly from the Cuban-American community in the United States. It would be foolhardy to expect a Cuban transition to mirror that of any of the former CPEs. However, given the limited tools for analysis available to those wishing to study the Cuban economy in a post-central planning environment, the experience of the Visegrad countries provides a useful point of comparison. It is, after all, the closest to the Cuban experience in the world today. 1. Although always low, estimates for employment in the private sector in the Czech Republic differ widely by source. 2. In fact, Poland was the only Eastern European centrally planned economy that never imposed the collectivization of agriculture but instead tolerated the existence of private property in rural sectors. ASCE’s blog seeks to publish high quality, original articles on the Cuban economy and related topics. The articles should have an empirical or analytic bend and should be no more than 1300 words in length. Articles can be written in English or Spanish. Send your articles, bio to asce@ascecuba.org. Copyright © 2019 · ASCE · All rights reserved.